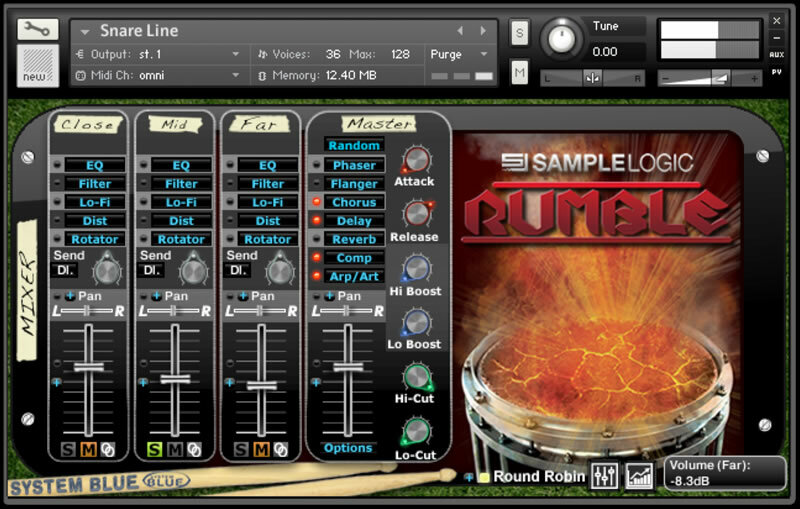 Rumble, Virtual Drum/Percussion from Sample Logic. 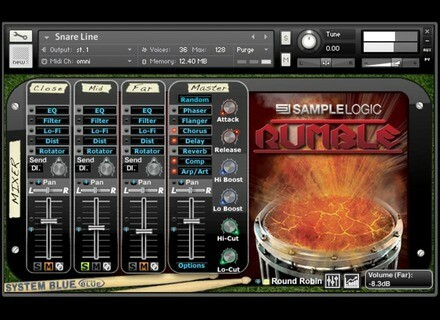 Sample Logic and System Blue have joined forces to release Rumble - a Kontakt Player virtual instrument that combines traditional marching drums with cinematic sound design. Rumble delivers a set of marching drum samples. Each instrument was captured using film score recording techniques at multiple dynamic levels, round-robins, and at close, mid, and far microphone placements. Sample Logic and System Blue have also partnered up with Avid delivering Rumble with integration in Avid's Sibelius 7 music notation software. Rumble offers control over sound and performance, thanks to Sample Logic's Kontakt Player interface. Building on the "multi-core effects sequencer" first introduced in their Cinematic Guitars collection, Sample Logic is designed to let you control everything from spatialization and sound-swirling effects to sequencers, LFOs, programmable arpeggiation, a Rhythmic Articulator, and a multi-microphone mixer. Rumble also contains a newly invented loop engine that displays loop slices graphically and supports independent editing, effects processing, and real-time automation of each slice. All together, Rumble features 40 screens of user interface controls. Every instrument included in Rumble has a set of parameter randomization options designed to give you power to morph and sculpt the instruments in the library. Kontakt Player 4.2.3 or higher. Kontakt (Player) 4 supports: Stand-alone, VST, Audio Units, RTAS (Pro Tools 8 and higher), DXi, ASIO, Core Audio, DirectSound, WASAPI. Native 64-bit support for stand-alone and plug-in versions on both Mac and PC. Compatible with major DAWs and with music notation software. Rumble has an MSRP of $299.99 and is now shipping. Rumble Download Version will be available August 16, 2011. Cableguys MidiShaper v1 Available Cableguys have announced that version 1.0 of their new MidiShaper plug-in is available now. AudioFront DSP Trigger for Mac VST AudioFront has announced the release of the Mac VST version of its DSP Trigger plug-in. Fostex AR-4i Fostex announces that its new AR-4i Audio Interface for iPhone4 is now shipping.